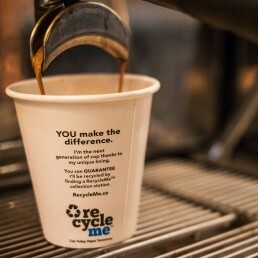 As part of our review of all sustainable practices across our entire business, going beyond the coffee sourcing, we made the decision to convert 100% of our wholesale takeaway cups to Detpak’s RecycleMe™ program. We have committed to rolling this out with our café partners over the coming months. 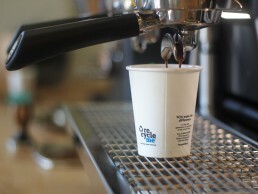 Single use cups & lids have long been a key issue for many within the coffee industry. Due to the plastic inner lining that keeps the coffee from soaking into the outer paper layer, they aren’t easily recyclable. In fact, over 1 Billion disposable cups end up in landfill each year, so this was certainly one area we were keen to reduce our impact. While we’d ideally love everyone to be taking reusable coffee cups with them wherever possible, we know this isn’t always realistic or practical. So, the question remained; if consumers are going to continue to use disposable cups & lids, how can we reduce the impact this has on the environment? This led us to investigate many different options when considering our takeaway cup footprint. Some solutions didn’t meet our desired criteria. We felt some may be doing more harm than good when not composted correctly, breaking down over many years & releasing harmful greenhouse gasses into the environment in the process. Some had no solution for the lid or required they be disposed of separately by the consumer. 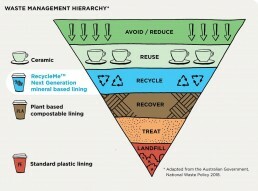 Some required specific commercial facilities in order to breakdown, leading many compostable cups to end up in landfill anyway (estimated less than 1% of cups ended up in commercial composting facilities). While we believe composting is certainly a viable alternative to waste ending up in landfill, our biggest concern remained; the cup is essentially still ‘single use’. We ultimately felt that paper is too valuable a resource to be discarded after only one use when there are other alternatives available. 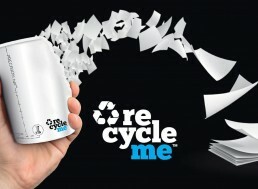 Our research eventually led us to Detpak’s award-winning RecycleMe™ program. Endorsed by Planet Ark, this solution checked many boxes for us. 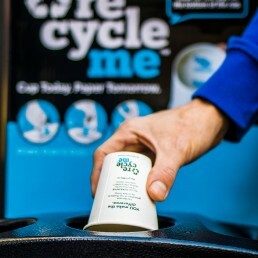 The system guarantees all correctly disposed RecycleMe™ cups and lids collected will be recycled. The paper reclaimed from the cups can be recycled into other paper products up to seven times, making the most of this resource and saving trees in the process. Lids collected will also be recycled into plastic products like picture frames. 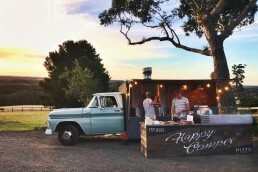 They’re able to do this by providing a complete end-to-end solution. The in-store, specially designed bins make it easy to manage the separation of the lid from the cup & dispose of any excess liquid in one, convenient place. The RecycleMe™ cups feature a next generation lining, that allows them to be recycled easily, using existing infrastructure. 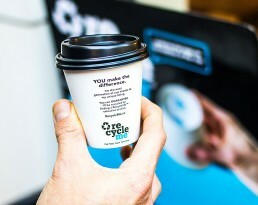 To fight the war on waste, Detpak have teamed up with the right companies, like Shred-X (in Aus) who collect the cups & lids from the registered cafes, remove the inner lining from the cup & send them off to existing paper pulping facilities for recycling. This also ensures that 96% of each cup can be recycled (everything but the lining). So, what does this mean for the consumer? Realistically, this system can only work when the cups & lids are disposed of in designated RecycleMe™ bins, which can be found in many venues around Australia & counting. Here we feel that education is the key; us as roasters, along with our café partners, will be vital in educating the consumer to firstly, identify the cups as RecycleMe™ and secondly, to understand they should be held onto & returned to the collection stations whenever possible. They will not be recycled if placed into everyday recycling bins unfortunately, due to the inner lining. After collecting the cups & bins from the in-store collection stations, Shred-X also provide venues with a certificate tallying the number of cups captured & the impact these cups will have environmentally, through recycling. According to a study conducted by the Environmental Paper Network, if just half of the paper cups in Australia & NZ were recycled, we would be saving 496 trees per day! This is a program we strongly believe in & one which we hope will further empower cafes & consumers to take responsibility for their waste. I want to help, what can I do to ensure my cup/lid won’t end up in landfill?? 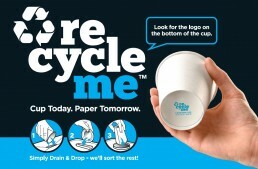 Check the bottom of your takeaway cup for the RecycleMe™ logo. All cups bearing the logo can & should be recycled! Hold onto it and dispose at any one of the collection stations. The bins have info regarding correct disposal; empty any excess liquid, remove the lid and place the lid & cup into their labelled slots. The bins will be emptied & taken to the appropriate facilities for recycling. Interested in learning more about Locale and our other sustainability actions & initiatives?